Many of those who have acquired copies of the original sheet music for Russ Conway's compositions have been dismayed to find that they bear little relation to the way the tune was played on Russ's recordings. This was certainly my own experience back in about 1959/60, and I often used to wonder whether somewhere down in Tin Pan Alley – 600 miles from my home – there might exist “professional” versions of these compositions that more accurately reflected what Russ could be seen playing on television. The published arrangement of Side Saddle was a particular disappointment. Not only was it a highly simplified version, it was also presented in the key of G, whereas Russ always played it in E flat (for reasons that are explained below). Snow Coach and Royal Event appeared in similarly unsatisfactory, excessively simplified arrangements, and although there were clues to Russ's piano style in Roulette and Rule, Britannia!, none of the published arrangements that I have seen fully represented his performances on records, radio and television. Not a single one of them would be suitable for a public performance as written, unlike the works of Billy Mayerl, Winifred Atwell and a host of the so-called Novelty pianists of the twenties and thirties, which were written out exactly as recorded by the composers. In those days a veritable cornucopia of tricky syncopated piano pieces were available to challenge the more ambitious pianist. Russ claimed that he was unable to write music, and we might reasonably surmise that someone in a publisher's office could have had the job of writing out his compositions in musical notation. In earlier times George Gershwin had recognised that much of the sheet music of his songs was purchased by little girls with little hands who had not progressed very far in their piano studies, so no doubt Russ's publishers had an eye on the potential for sheet music sales. However, Gershwin went on to publish some quite demanding piano solo arrangements of 16 of his songs to satisfy the needs of the more advanced pianist, and these arrangements are now standard repertoire, with one of them even appearing in a recent Grade 8 Piano Exam list. Sadly, Russ did not do likewise, and by the time I had suggested to him the possibility of writing down some rather more realistic representations of what he played, his popularity had already declined too far. He ran the idea past Cyril Gee of Belwin Mills, but Gee's letter of reply expressed the view that Russ would have to secure more media exposure before such a project could be commercially viable. Don Shearman, Russ's Musical Director for many years, told me that he too had suggested writing down Russ's arrangements, but Russ was of the opinion that such an exercise would be compromised by the fact that he played things differently each time. That was undoubtedly true up to a point, but I share Don's view that there was sufficient similarity between performances for something worthwhile to have been annotated. It certainly wasn't that Russ was unwilling for others to see what he played: when I raised that question with him, he went on to tell me about the popular piano duo who had recorded Side Saddle using four hands to play what he had played with two! He had nothing to fear from the would-be imitators. 1. The professionally treated honky-tonk piano is an instrument to which pianists do not normally have access. It is therefore unusually difficult to work out which notes need to be played to achieve a particular sound – certainly much more difficult than if the same notes were being struck on a properly tuned grand piano. 2. The presence of a rhythm accompaniment makes it especially hard for the ear to distinguish the contribution of four or more percussive instruments (double-bass, guitar, drums as well as piano). Although one could reasonably guess what the left hand was doing, the fill-ins and extra notes in the right hand require rather more deciphering, especially given Russ's tendency to break or to repeat parts of right hand chords as a rhythm and syncopation device. In Lesson One there is even a second piano to be detected in the stereo recording: if Russ's honky-tonk piano is cancelled out by reversing the phase of one channel and combining it with the other channel, the second piano can be clearly heard. 3. The EMI recordings were released in mono in the early days (most of us only had mono record players) and they were subjected to substantial processing before cutting (equalisation, and possibly other effects such as compression) to give them more impact when reproduced through a wide variety of record players, radios and radiograms – and even the gramophones that were still in use! 4. The high incidence of harmonics excited by the lacquered hammers and the unevenness of the voicing could sometimes make it difficult to decide which octave a particular note was being played in. 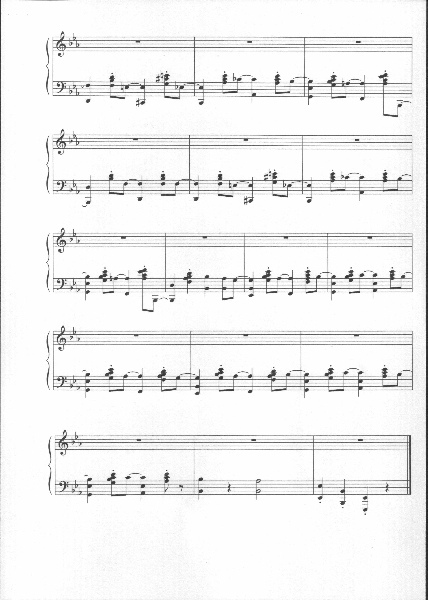 In the released version of Royal Event, for example, the start of the main melody sounds clearly as though it goes down from B flat to E flat, contrary to the sheet music version in which it goes up from B flat to E flat. In fact both are correct, but in the recorded version the E flat is played as an octave in which the lower note predominates. 5. Unlike so many of the contemporaneous honky-tonk pianists, the real Russ had a particularly well developed ear for harmony and chords, so that it was not enough to know, for example, that a particular harmony was required: you had to figure out what variant of the chord was being deployed. The key to Russ's honky-tonk style lay in the left hand, and there was some guidance on this in the third chorus of Roulette – the variation in A major. Here it was apparent that the left hand alternated between bass note on the first and third beats of the bar, and chord in the tenor region of the keyboard on the second and fourth beats of the bar. More significantly, however, the bass notes were typically preceded by another note a 9th or a 10th above it, and annotated as a grace note. As these notes are generally too far above the bass note for a hand to stretch comfortably, especially at speed, the thumb would flick out to catch the upper note while the hand was on its way down to the bass. Thus the upper note of the tenth would be played before the beat while the bass note was played exactly on the beat. This is called the BACK-TENTH, and it is the single most recognisable feature of Russ's honky-tonk style. Take that away, and you lose its essence, its defining attribute. This is quite clearly not provided by the rhythm accompaniment: the rhythm section can support, but it cannot replace the left hand back-tenths, as is evidenced by the middle section of Side Saddle in its 1959 version. Most pianists find the back-tenth difficult to play. Those who were brought up in the classical idiom would expect to play an interval of a tenth that is too big for the left hand to put down as a chord, by breaking it upwards from bass to treble. This was characteristic of the style of Fats Waller, Charlie Kunz, Billy Mayerl, George Gershwin and Mrs Mills, to name only a few. In such a case the bass note would precede the upper note of the tenth, and more significantly the bass note would sound before the beat while the upper note of the tenth would sound exactly on the beat. The back-tenth runs contrary to normal classical training. The back-tenth was not unique to Russ Conway. It had appeared on occasion in the playing of Fats Waller, James P. Johnson, Carroll Gibbons, Joe “Mr Piano” Henderson, and no doubt many others. However, Russ played it his own way and in combination with his right-hand style he produced a completely new and unique piano sound. Russ claimed that an injury to the fifth finger of his left hand influenced his choice of back-tenth rather than forward-tenth, but he may possibly have decided for other reasons to do things his own way. 1. The bass note is played exactly on the beat, and will therefore coincide with the bass note of other musicians in the ensemble. 2. If the upper note of the tenth is played with a flick of the thumb on the way down towards the bass note, the hand movement up and down is more evenly distributed, as you don't have to move rapidly leftwards to catch the bass note before the beat. As a result it is possible to play more quickly while still incorporating the rich sonority of the tenth. 4. Besides back-tenths, the left hand can also throw in some back-ninths, back-sevenths and even on occasion (eg Snow Coach, Royal Event, intro to Side Saddle) the odd back-eleventh. A form of counter-melody can therefore be generated that is clearly heard and is entirely consistent with the prevailing harmony. After all this theorising, we really need to see an example of the back-tenth style written out. 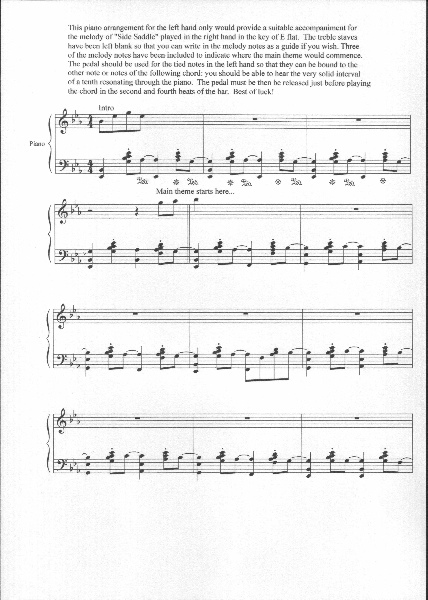 In the absence of permission to reproduce an arrangement of a work that is still subject to musical copyright, the best we can do is to examine a sequence of chords in the left hand that could with appropriate adjustment for the technical capabilities of the pianist be deployed as an accompaniment to the melody of Side Saddle played in the right hand. A few notes on performance might be helpful. 1. The upper note of the back-tenth is played exactly a quaver before the bass note, as notated. 2. Use the thumb on the upper note and the fifth finger on the bass note. 3. The pedal is used to catch the upper note and bind it to the bass note, and the pedal is then held down while the left hand moves up to the chord on the 2nd and 4th beats of the bar. The pedal is released as the chord is played, and should not be held down any longer. No more than a quaver will elapse before the pedal has to be depressed once again to catch the next back-tenth. 4. Always think of the upper note of the back-tenth as belonging to the bass note and NOT to the immediately preceding chord (despite the inadequacy of the notation). 5. Practice slowly at first, with separate hands and try to memorise so that you can watch the keyboard like a hawk. It might be worth simply practicing the bass notes and chords without the back-tenth at first just to get the hang of the jump. When you then put in the back-tenth, think of it as simply flicking the upper note of the tenth with your thumb on the way down to the bass note. 6. Stretch the hand as wide as you can while making the jump from upper note to bass note. Don't keep your hand bunched up, as it makes the jump bigger than necessary. 7. With practice you will find that you only have to fix your eyes on the upper note of the tenth because the stretch and small jump will automatically locate the bass note for you. You will then be looking at the right area of the keyboard for the chords on the 2nd and 4th beats. 9. When you are able to add the melody in the right hand, you will find in slow practice that the melody note often appears to clash harmonically with the upper note of the back-tenth. This is never noticeable when you play it up to speed, and even at practice speeds your focus on binding the two (or three) notes of the tenth will disguise any dissonance. 10. Sometimes it's worth dropping a note here and there in the 2nd and 4th beat chords to make it easier to play fluently or at speed. No one will notice! 11. Memorise it so that you can play it without having to look at the music. You need to watch the keyboard. If you tackle it properly, memorising is not as impossible as some seem to think. It's hard work, but it's not impossible. I might observe here that I have some sympathy with Russ's concern about annotating something he would play slightly differently each time. I find it very difficult to write out exactly what I play, not least because the two hands are not always entirely independent, but also because I can't play exactly the same every time either! All I can do is to provide enough of a starting point for someone who wants to learn and absorb the piano style so that it can then be easily applied to other tunes, and so that it can become “your” style rather than someone else's. You'll notice that one of Side Saddle's great attributes as a composition is that the harmony changes every two beats. It's always going somewhere; it doesn't get stuck on the same harmony for bar after bar. It sounds good on any piano, from concert grand to jangly old upright. Of course, Russ's recording piano (actually, it was EMI's studio honky-tonk piano, and more than one such instrument was used during Russ's recording career with EMI) was specially treated to deliver the honky-tonk sound. This was achieved by two distinct operations. 1. The hammers were artificially hardened by the application of a lacquer to the striking surface. 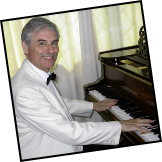 Such lacquers are standard materials for use by the piano technician, but Russ told me the “Showbusiness secret” – and subsequently broadcast it on local radio! – that for at least one of his honky-tonk pianos they had used clear nail varnish. I can personally vouch for the fact that it works. It is also irreversible, so do not try this at home unless you really want this special sound. The only cure is to have all the hammers replaced. 2. The piano is detuned. Where there are two or three strings to a note, one of the strings is tightened or slackened* by a few cycles per second. In the case of the A above middle C which is 440 cycles per second, one string can be adjusted to 442 or 443 so that the difference frequency of 2 or 3 cycles per second is heard as a 'twang' or 'doi-oi-oing' sound. In my experience it is better to avoid overdoing the mistuning: de-tuned notes that sound fine as individuals can sound terrible when played as part of a chord. It is much better to under-do it. It is also preferable to vary the degree of 'twang' from note to note. Electronic pianos with a honky-tonk voice have too uniform a sound which is unrealistic and unsatisfying. * My own preference is for tightening rather than slackening the string, on the basis that it is likely over time to drop back in pitch towards its companion strings and thus avoid aggravating the mistuning. Some have suggested tightening one of the three strings and slackening a second, but I think that is unnecessary. Click the speaker to hear the Russ Conway Tribute by Mike Thomson. Sound clip recorded at St Georges in Bristol on 11th November 2016 for the Armistice Day Concert. Introduced by Ali Vowles. Mike Thomson sadly passed away on the 11th February 2018 aged 71, after a short but very brave battle with pancreatic cancer. Mike was an astounding musician and pianist, who had the uncanny knack to analyse a Conway or Atwell tune and replicate them note for note. So good, many could not tell the difference between the originals.........including Russ ! Many of Mike's videos can be seen on YouTube and have been viewed and followed thousands of times. Mike shared his knowledge of music freely and contributed articles in the Russ Conway Appreciation Society magazines and here on this website. 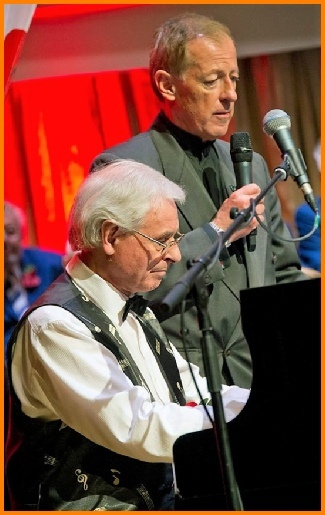 Mike performed on stage numerous times for charity and benevolent events organised by Richard Hope-Hawkins and also accompanied the legendary 50’s singer Joan Regan during a summer season at Clacton. More importantly, Mike was a people person. A humorous, good natured and much loved family man, who together with Bill Murden threw the doors of his home open, over many years, to host open days for the Russ Conway Appreciation Society members. As a result of these meetings, many friendships have been made. Whether you knew Mike personally or not, he will be greatly missed. Rest in peace our good friend.